I recently encountered the Proust Questionnaire. It is a regular feature in Vanity Fair magazine, where it is answered by a guest celebrity. The two instances I read were with the late Carrie Fisher (Princess Leia) and Louis CK–two very interesting personalities. I was looking for a framework upon which to build some writing for the Writers’ Shared Interest Group (SIG) of which I am a member. When I got about halfway through I thought, “Voila! This would be a good architecture for an interview with a very objective voluntaryist. So I have put myself into the personification of a scholarly, principled, individualist voluntaryist to imagine how honest answers to these questions might look. I don’t know perfect happiness, but from a voluntaryist standpoint, I would imagine that it would be everything voluntary! While we wait for that perfection, let’s make each human interaction voluntary for both parties. I say both because I believe that 1-to-many or many-to-many interactions are essentially non-voluntary, requiring some degree of coercion. My greatest fear is to be compelled by an authoritarian. I know of no one who is more qualified to manage my life than me. That is not driven by arrogance. I fully accept that I will make errors, and must live with them. But consider the tragedy that arises when someone, artificially placed over me, makes an error that I will have to live with the rest of my life. That authoritarian has stolen some of my life. The knee-jerk default to intervention is a habit hard to break. 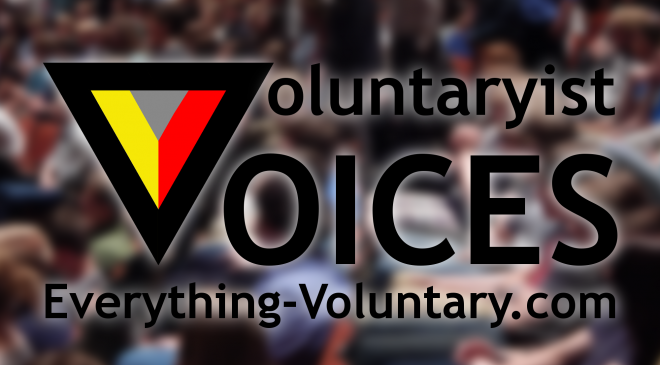 I began to self-identify as a voluntaryist at the beginning of my septuagenerian years. That is seventy years in which I operated unwittingly through indoctrination. The habit of intervention is very hard to break. The knee-jerk default to intervention is a habit hard to break. Everyone spends some portion of their lives prevailed upon by indoctrination. Each of us, voluntaryists, has a time when we began to think critically about whom is really in control of one’s self and one’s individual life. That leaves some period, perhaps years, in which one operates, probably unwittingly, through indoctrination. The habit of intervention is very hard to break. I most admire a true voluntaryist. One who recognizes that there is a non-aggression principle in which one does not initiate aggression or commit violent acts except in defense of that which belongs to the individual voluntaryist. This is not a license to use force, rather it is a recognition that force can only be used within the four corners of defense of belongings. What are belongings? One’s self, one’s voluntary relationships, one’s extended property improved by one’s industry. And force is the last resort, for one has a responsibility for solving problems by reason before force. Nothing in the self-defense exception grants a right to kill or to steal or to defraud or to bear false witness. We often hear of the NAP permitting killing in self-defense. There are no permits. The ability to grant permissions belongs to no man. You either intervene or you don’t. The natural obligation in disputes between individuals is to expunge the dispute in the most peaceful, constructive manner possible. Failing that, or not, each involved individual must shoulder the consequences of her actions. There are no extravagances. These are only figments of the imaginations of interveners. Do what you will, understanding that all natural laws with consequences have not, and never will be, repealed. My state of mind is free because I understand that freedom comes from within the individual. The people who are most unfree are the ones who have been indoctrinated to the idea that you must have permission from some authority before you may proceed. I will quickly grant that you may be constrained in a physical sense. You are not naturally free to be 100 feet tall. What one must do is to understand the natural condition of freedom. Freedom complies with the laws of physics and economics. One is born free–without physical attachment to any other. All attachments, which we will now call relationships, are voluntary. Babies may be temporarily dependent on the development and experience of their elders–if abandoned, human babies will usually die. At some point, earlier than most of us normally think, however, the baby decides to stay or go, physically and/or psychologically, to leave the auspices of their caregivers. Failure to elect freedom makes two slaves, the one who will not remove oneself from supervision, and the supervisor who will not relinquish supervision. Loyalty, in its many forms. For instance, patriotism is loyalty to the sand inside a closed line drawn in the sand. Loyalty is usually a virtue demanded by the undeserving of those who are capable of running their own lives and deciding which arbitrary attachments to pursue. I have no quarrel with those who value loyalty, but I see no gain in attaching oneself to an abstraction. If I have the luxury of seeing into the future, wherein I know the truth is not critical, I have no qualms about lying to preserve my right to independence. This is a version of the NAP. If what you say is in defense of one’s natural rights, an appropriate lie is appropriate. An example would be when your significant other, whom you have associated with voluntarily, asks, “Do these jeans make me look fat?” then, discretion is the better part of truthiness. I only have a problem with appearances that are chosen to misrepresent essences. To be sure, I would like to be my twenty-year-old self again for a number of reasons. But as long as I meet the approval (sometimes tolerance) of the man in my mirror, I am mostly content with my appearance. I hasten to admit that I’m not doing any fashion spreads for GQ magazine. When I was young, I adopted R. Crumb’s Mr. Natural as an alter ego, and apart from a dwindling interest in alter egos, I still like the premise. I have no single person in mind for I despise certain behaviors, not individuals. I despise manipulation including the irreversible crimes against fellow humans that are proscribed in several of the 10 Commandments. Modern examples of manipulation are warmongering, war profiteering, arrogance, excessive greed, and lying for gain. 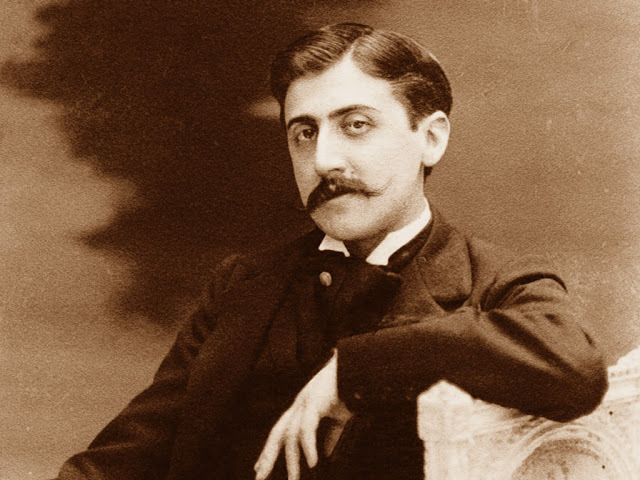 Maybe in Proust’s day, there were mostly unavoidable roles by gender, but I do not see non-biological differences among sexes. So, what qualities do I most like in humans? I like the qualities that attend voluntaryism. When humans act on those attributes, I like the effect the most among effects. What are some of the main attributes? Reasonableness, flexibility, patience, and awareness of self-organizing phenomena. I overuse freedom, individual, responsibility, judgment, knowledge, and wisdom. And I intend to go right on overusing them. People, places, things, and events with which I have formed voluntary relationships, usually on a one-to-one basis. One-to-many, many-to-one, and many-to-many relationships are very difficult for which to maintain choice and responsibility. I am always happy when I have choices about what to do next so that I can take responsibility for consequences. I am also happy when I have made a choice which turns out to be bad to have the ability to atone for the past and to have the knowledge to avoid the consequences in the future. I would change my distrust of change. R. Buckminster Fuller opined, “In order to change an existing paradigm you do not struggle to try and change the problematic model. You create a new model and make the old one obsolete.” In other words, one does not struggle with the problem, one redefines the problem toward an organic model of the outcome desired. This is a beneficial application of the idea that the end justifies the means, because both the ends and the means will likely evolve from an appropriate description of the need. In some cases, the description arises accidentally from events. For the sake of brevity and expedition, I am publishing herewith the answers to the first half of the questionnaire. I list the upcoming questions below as a preview. I will return soon with the completed set.